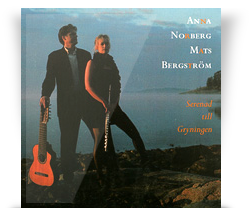 Anna Norberg (flute) and Mats Bergström (guitar). Works by C Ph E and J S Bach, Godard, Gunnar Hahn, Nielsen, Takemitsu, Rodrigo and Piazzolla. CD-Kammaren CDK 1. Out of print, but now available on iTunes and Spotify.